I was planning to write a recap the Seacoast Half Marathon. I was flying high after that race because I finally was able to negative split and once again finished under 1:50 (1:49:38 to be exact). Unfortunately, my mind is elsewhere right now. My mind is thinking about my best little bud, Manny, who I had to say goodbye to yesterday very unexpectedly. This year I have been challenged mentally many times, three of those times were because of the now 3 dogs who have gone up to heaven, and are waiting for me at the rainbow bridge. Manny was a very special little guy. I got him during the summer of 2004. I was not in a good place, I had decided college wasn't right for me at the time, and I was struggling with depression and an eating disorder. 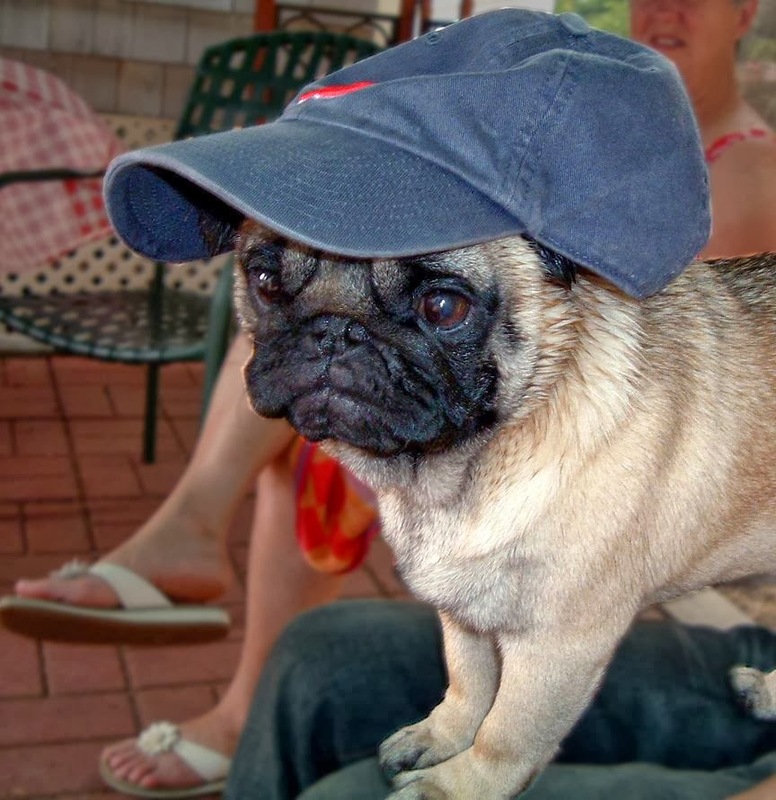 I felt like I really wanted to get a dog, a pug specifically, because I believed it would give me something to care for and help me heal. I was living at home at the time, and my mom graciously agreed to let me get a puppy, and offered to buy one for me. I found a breeder, and waited anxiously for the dog to have puppies. When Manny was ready to be picked up we drove a couple hours to northern NH to pick him up. It was love at first site. He was the cutest little man I had ever seen. I was so excited to take him home and love him unconditionally. 1st day I brought him home. Such a peanut. Side note: yes, he was named after Manny Ramirez. He was born May, 19 and I spent the next 8 weeks trying to decide on a name. I loved the Red Sox, and Boston, and was trying to think of the perfect name. Manny seemed to fit. That summer the Red Sox went on to FINALLY win the World Series…and Manny Ramirez was named the MVP. I will never forget watching those games with Manny on my lap, cheering for Manny Ramirez and the Red Sox. I think Manny and I played a role in their victory, clearly. Over the next 9 years, Manny gave me everything I needed and more. He was there for me in ways that no one else could be. He made the move with me in and out of apartments, down to Boston, and back to my mom's house when I ran out of money. He comforted me when I was sad. He was the best cuddler and such a little goofball. He never strayed far from my side. When I got up, he got up. When I went in to the other room, he went in to the other room. When I was cooking or making food, he was standing by my feet waiting for bits to fall on the floor. When I went in to the bathroom, he went in to the bathroom. When I took a shower, he would stick his head in and try to join. When I did homework on the couch, he would crawl on to my lap and try to help (it didn't help). He was the greatest gift I could have ever received. He made my life much better for 9 years, and for that I am truly grateful. 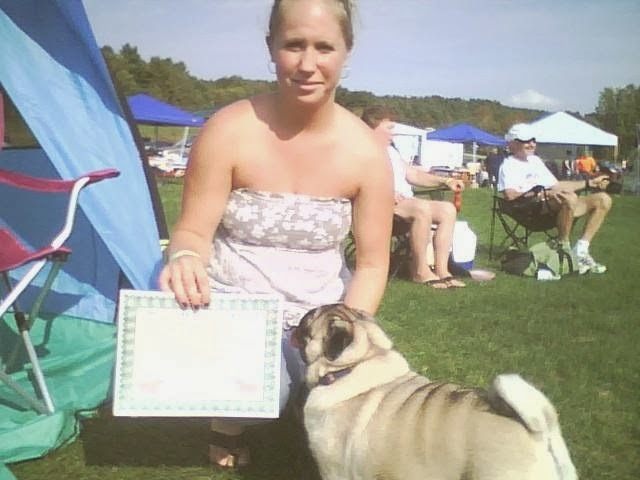 I look ridiculous, but this is a certificate for "best wrinkles"
from a pug social…yes, I went there. Manny has been living with my mom for the past year because I moved in to a couple apartments that didn't allow pets. 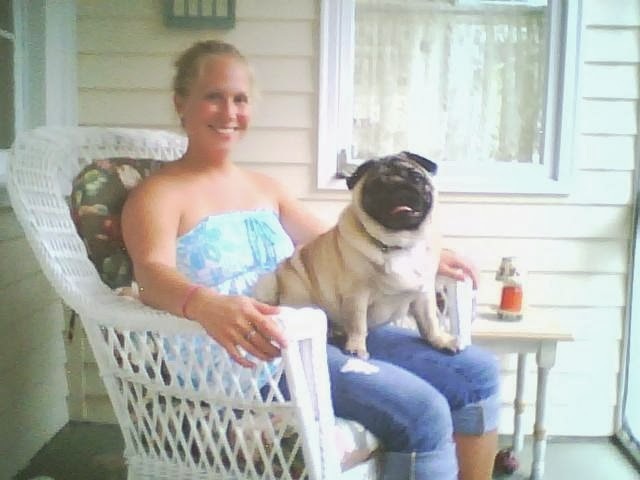 My mom also had a pug, Mack, and they were great friends. Earlier this year we had to say good bye to Mack. He was blind, deaf, had doggie-demetia, and slowly started to lose control of his back legs. It was very hard to say good bye to Mack, but thankfully we had Manny to once again help us through a sad time. Shortly after Mackie went, Manny started to have problems of his own. Most recently he started to have lesions appear all over his skin. The vet was unsure for a while what it was. They did test after test, misdiagnosed him, and gave him medicine that he wouldn't take. He slowly stopped eating much of anything, and refused to take any pills. He went back to vet because it seemed like he was also starting to retain fluid in his stomach. He had a biopsy done of his skin, and the results came back saying it was an autoimmune disease. He was put on prednisone and we were told he would start to feel better almost instantly. He didn't. The next day he was worse, wouldn't eat, wouldn't take the prednisone, and his stomach looked bigger. Back to the vet he went to spend the night, which would hopefully allow them to give him his medicine and get some nutrition in to him. They also did more blood work to try to determine why he was gaining fluid. Yesterday we got a phone call that the blood work showed he was in acute liver failure. There was nothing we could do. I left work to meet my mom, and my boyfriend, and together we went to the vet to say goodbye to my best little bud. After all the times he allowed me to lean on him and help me through difficult times, yesterday I needed to allow him to lean on me, help him get through this and know everything would be ok. That is what he did. I wrapped my arms around him as I always did and slowly he let go of control, and put all his weight on to my arms. He went to sleep as we told him how much we loved him and how good of a boy he was. He was my best boy. 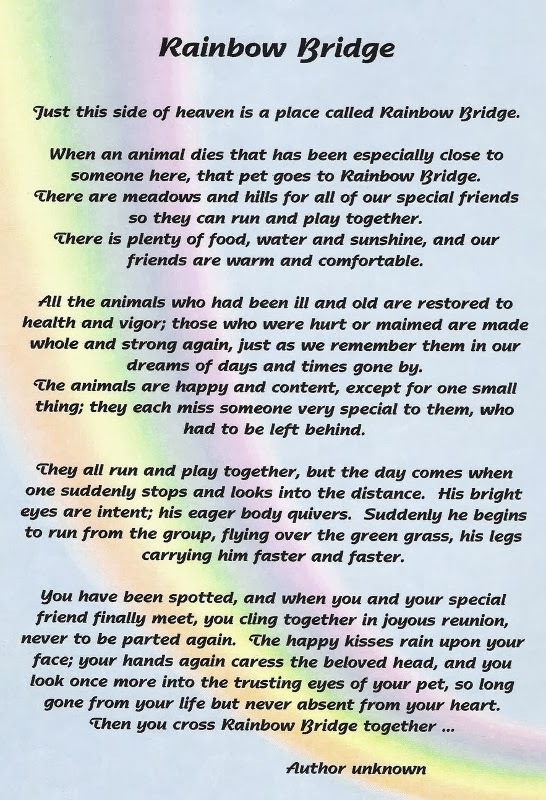 I think of him now once again playing with Mack, and Kaylee at the rainbow bridge, waiting for the day when we meet again. I love you, Manny and will think of you every day. I'm so sorry to hear about Manny. It is never easy to lose a pet and I've had to say goodbye to one of our dogs this year too. He was a very lucky guy to be loved so much. Sending hugs your way. Omg I am sooo sorry. I am totally crying for you. Aww i don't have words. I am here for you. I lost both my cats over the past 2 years and it's incredibly hard to lose a pet. Thinking of you! So sorry to hear this! :( All those pictures are so adorable. Let me know if you need anything! I am so very sorry for your loss of Manny. Pets are family members and saying goodbye can be so hard. Hugs.